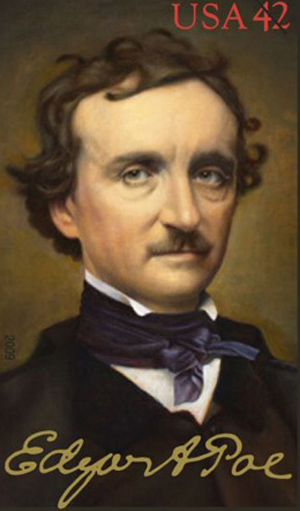 Edgar Allan Poe (born Edgar Poe; January 19, 1809 - October 7, 1849) was an American author, poet, editor, and literary critic, considered part of the American Romantic Movement. Best known for his tales of mystery and the macabre, Poe was one of the earliest American practitioners of the short story, and is generally considered the inventor of the detective fiction genre. He was the first well-known American writer to try to earn a living through writing alone, resulting in a financially difficult life and career. In January 1845 Poe published his poem, The Raven, to instant success. His wife died of tuberculosis two years after its publication. For years, he had been planning to produce his own journal, The Penn (later renamed The Stylus), though he died before it could be produced. On October 7, 1849, at age 40, Poe died in Baltimore; the cause of his death is unknown and has been variously attributed to alcohol, brain congestion, cholera, drugs, heart disease, rabies, suicide, tuberculosis, and other agents. But as in ethics, evil is a consequence of good, so in fact, out of joy is sorrow born. Either the memory of past bliss is the anguish of today, or the agonies which are have their origin in the ecstasies which might have been. Made in his image a mannikin merely to madden it? Coincidences, in general, are great stumbling blocks in the way of that class of thinkers who have been educated to know nothing of the theory of probabilities- that theory to which the most glorious objects of human research are indebted for the most glorious of illustration. I have great faith in fools- self-confidence my friends will call it. I was never kinder to the old man than during the whole week before I killed him. I was never really insane except upon occasions where my heart was touched. It is with literature as with law or empire- an established name is an estate in tenure, or a throne in possession. Literature is the most noble of professions. In fact, it is about the only one fit for a man. Men have called me mad; but the question is not yet settled, whether madness is or is not the loftiest intelligence– whether much that is glorious– whether all that is profound– does not spring from disease of thought– from moods of mind exalted at the expense of the general intellect. Sleep, those little slices of death- how I loathe them. The customs of the world are so many conventional follies. The most natural, and, consequently, the truest and most intense of the human affections are those which arise in the heart as if by electric sympathy. The realities of the world affected me as visions, and as visions only, while the wild ideas of the land of dreams became, in turn,- not the material of my every-day existence- but in very deed that existence utterly and solely in itself. There are certain themes of which the interest is all-absorbing, but which are too entirely horrible for the purposes of legitimate fiction. To observe attentively is to remember distinctly. We should bear in mind that, in general, it is the object of our newspapers rather to create a sensation - to make a point - than to further the cause of truth. In the hatred of a minute. Our flowers are merely- flowers.